Do you consider yourself an English expert? Do you find yourself correcting people’s grammar in the comments section? Well, it’s time to put your language skills to the test by taking this difficult English quiz. You’ve faced a lot of English quizzes from us, testing you on the ins and outs of the language. You may think that you’re prepared for any upcoming quiz along the same line, but be warned that the quizzes will keep getting more challenging. Not only should you know the meaning of commonly seen words like “envisage” and “paltry”, you should also be able to identify their synonyms and antonyms as well. We’re leaving no stone unturned as your pronunciation skills will be tested too. Have you been pronouncing words like “quinoa” and “asterisk” correctly? You should also be able to spot grammatical errors in sentences, whether they are mistakes in punctuation or parts of speech. If you’re knowledgeable in all these topics, you may just pass this quiz. But to ace it, you need to be a real pro. This quiz may be the hardest one you’ll ever take! Which is the synonym of "envisage"? Which is the correct pronunciation of "anemone"? Which is the antonym of "squire"? Which is the correct spelling of this synonym of "ranking"? Fill in the blank: Make sure to dot your ___! Which is the definition of "unabashed"? Which is the synonym of "paltry"? Which is the correct pronunciation of "asterisk"? Which is the antonym of "beguile"? Which is the correct spelling of a system of government? Which of these sentences is NOT grammatically correct? To celebrate Todd's first day on the job, he and Michael went out for lunch. Todd and Michael went out for lunch to celebrate his first day on the job. Todd and Michael went out for lunch to celebrate Luke’s first day on the job. Which is the definition of "stifle"? Which is the synonym of "connote"? Which is the correct pronunciation of "quinoa"? Which is the antonym of "reprobate"? Which is the correct spelling of this synonym of "privilege"? Fill in the blank: Jennifer and Kim are coming, but ___ running late. Which is the definition of "dulcet"? Which is the synonym of "ensconce"? Which is the correct pronunciation of "sherbet"? 9 in 10 People Can’t Pass This English Quiz. Can You? 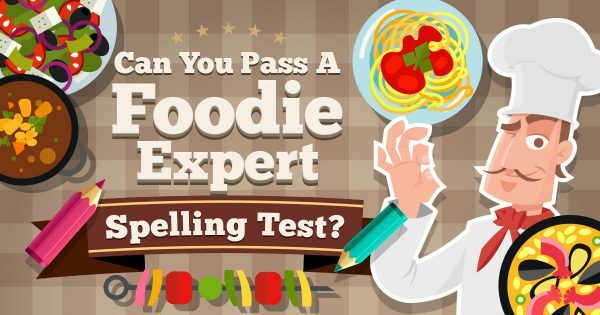 Can You Pass A Foodie Expert Spelling Test?